Aluminium Charkhi for kites with black colour . Size : 12"
A 1000 sq. meter plant has a capacity to produce half a million pulleys per annum. The profile forming division manufactures Ply-‘V’ Pulleys from 3 Groove to 10 Groove for Alternators, Power Steering Pumps, Fan Pulleys, Sensor Wheels and Water Pump Applications. 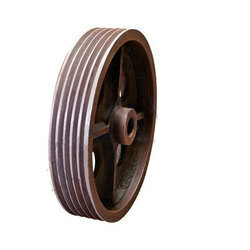 We are engaged in offering wide range of Metal Pulleys. 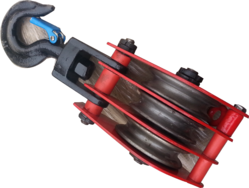 These pulleys are manufactured using high grade raw material procured from reliable vendors of the industry. Featuring a durable performance rate, long lasting nature and high tensile strength, our range of products can also be made on customized basis. Furthermore, these metal pulleys can be availed at industrial leading prices. The profile forming division uses a CAD/CAM facility for technical developments, product designs and simulations. Being a leading firm in this industry, we are deeply engaged in offering a high-quality range of Metal Pulley.